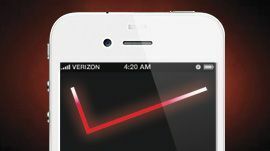 Now that Verizon finally has the iPhone, the next big question is how the phone will impact the market. Will people leave AT&T? Will Verizon see a huge growth in subscribers? According to online ad network Chitika, the real battle isn't AT&T vs. Verizon, it's iOS vs. Android. Examining a sample of 2.5 million click rates across the Chitika network, the company found that 55 percent of its Android traffic came from Verizon. Sprint had 25 percent, T-Mobile had 18 percent, but AT&T only had 2 percent. "So when Apple announced that the iPhone is coming to Verizon in February, not only did they tap into a huge pool of potential new customers, they also managed to attack Android at its most important point," Daniel Ruby, research director of online insights at Chitika, wrote in a blog post. The reason for AT&T's poor Android showing was unclear, Ruby said. "But if AT&T customers are simply choosing the iPhone because they prefer it, Android's market share on Verizon may be in big trouble," he wrote. "If, on the other hand, smartphone users simply think AT&T's Android lineup is subpar, then AT&T may be the company most at risk." Regardless of what happens, "Apple is set for a huge win," Ruby said, a sentiment echoed by Forrester and IDC analysts with whom PCMag spoke earlier this week. "The message here is, 'hey, we've got another channel for selling the iPhone," Charles Golvin, a principal analyst with Forrester Research, said about Apple. Will Stofega, program director for mobile device technology and trends at IDC, also thought the deal will help Apple battle the growing influence of Android. "Android's been taking off" and Apple "needs more distribution points," Stofega said.